Find education, answers and management support at ChicagoCondoResource.com, a comprehensive knowledge base and resource website for condo owners and board members in and around Chicago. Guests can view current condo news and local condo event listings on the website. Membership Plans are available for Owners and Board Members. Owner Subscribers have access to complete Condo Living A-Z articles and the full text of our popular “Ask the Expert” Q&As. They can also can submit “Ask the Expert” questions for an additional fee and receive personalized help for their specific condo issues. Board Member Subscribers have the same access as Owner Subscribers, with additional access to Educational Videos, Management Forms and Templates, and Recommended Vendor listings. 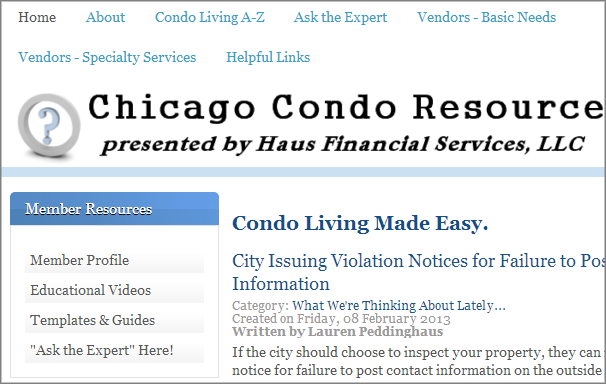 ChicagoCondoResource.com is an invaluable tool for condo education and self-management needs!